Autumn is the best time to surf in New Zealand – here’s an insider’s guide to two stunning surf spots off the beaten track. Two common misconceptions about surfing in New Zealand: the best place to go is Mt Maunganui and the best time to go is summer. Any Kiwi surfer worth their salt knows the best, least crowded waves are found well beyond the beaten track – in places like Wairarapa and Kaikoura – and autumn is the most swell-rich time to explore. 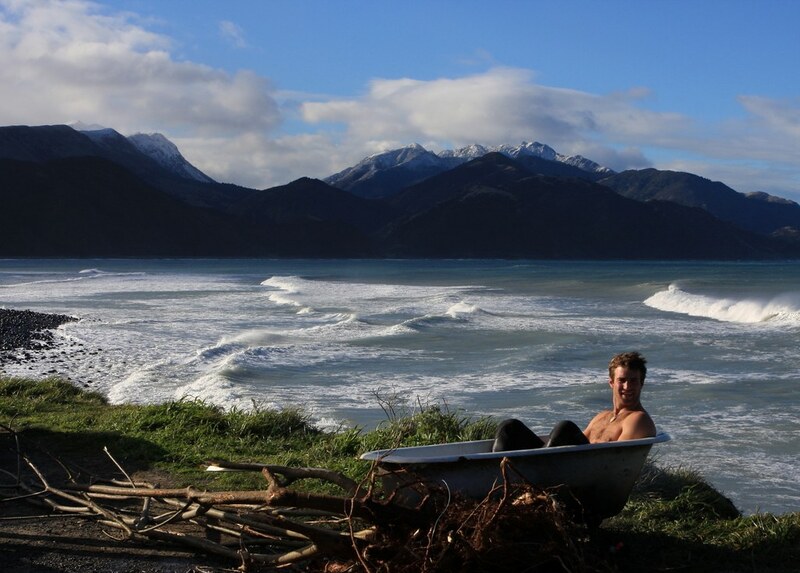 Wairarapa, on the south-east coast of the North Island, and Kaikoura, on the north-east coast of the South Island, are close on the map and in surfing terms they have much in common. In both places you’ll find powerful, uncrowded waves and spectacular landscapes. Both regions feature long boulder-edged point breaks, sand-spitting river bars and A-frame reef breaks. In autumn the blustery gales that usually batter these coasts subside for morning and evening glass-offs. Winds and sea currents arrive uninterrupted from down near Antarctica so pack a good 4/3 steamer and booties for this time of year. With the large seal colonies and abundant sea life, surfing here can make you feel like you’ve plunged a few links down the food chain. But don’t worry. Shark attacks are rarer than lightening strikes and the adrenalin rush from your first ride will help you focus on the task at hand: to surf perfect waves all day with just a couple of mates and a million sea creatures for company. In Southern Wairarapa the Lake Ferry Hotel is hard to beat for an after surf beer and great fish ‘n’ chips. From the garden bar you can watch the sun set behind snow-capped ranges. Kaikoura is the Maori word for crayfish – keep your energy up for surfing with a feast on these delicious local crustaceans, available at roadside caravans. Kaikoura is a major tourist mecca so there’s no shortage of accommodation in all price ranges. A number of eco lodges offer ‘small footprint’ options for the earth-friendly traveller. In Wairarapa you can combine wave hunting with wine tasting and enjoy boutique accommodation among the famous wineries of Martinborough. If you want to surf Wairarapa and Kaikoura on your Autumn Surfari, at some point you’ll need to catch the ferry from Wellington to Picton. Walk-on passengers will need to pay a small fee for their surfboard but there's no extra luggage charge or limit on how much you can pack in to your car, van or camper. Find out more about Bluebridge Cook Strait ferry ticket prices.